The Hitachi Touro Mobile Pro is a great-looking portable hard drive that offers fast transfer rates and additional online storage. Aesthetically, the Touro Mobile Pro looks like and iPhone 4S. The drive has a black reflective surface on top and bottom surrounded by a gray frame. Unlike the iPhone, which is constructed of glass and aluminum, the Touro Mobile Pro case is made entirely of plastic, and is bigger than the iPhone. The Hitachi name is clearly imprinted on the top of the drive (as if to remind you who made the drive), and on the bottom lays a single USB 3.0 port. As for the activity light, it’s on the opposite end of the name, and it lights up only when you plug in the drive. Because of the reflective surface of the Touro Mobile Pro, fingerprints, dirt and dust all show up, ruining the wonderful look of the drive. If you want the drive to keep looking its best, a regular wipe with a cloth will be required. The Touro Mobile Pro has a 7200-rpm hard drive inside, and includes a USB 3.0 cable, which you can attach to a USB 2.0 port. It also comes with Quick Install guide, and warranty information. The drive also comes with 3GB of free online backup storage provided by Hitachi. To access it, you install the included Hitachi Backup software. Once that’s done, you open the program and sign up for the service (powered by Memopal) and create an account. The software by default backs up your system’s Users folder to the cloud, but you can change what folders you want saved in the settings menu. You can also modify the backup schedule, limit how many versions of a file to save, and change how much bandwidth the program can utilize. To view files, you can go to the Hitachi Backup website, log in, and see what’s there. If 3GB isn’t enough, you can add 250GB for $49 a year. In all, the software was easy to use and settings were simple to understand, though the Hitachi website looks really sparse. The drive comes preformatted for Windows, and no software is included to format it for the Mac, so you’ll have to format it yourself using Disk Utility, especially if you want to use it with Time Machine. If you want to use the Touro Mobile Pro on both Ma and Windows, you’ll probably leave the formatting as is. We tested the 750GB ($130) Touro Mobile Pro. Hitachi also sells a 500GB version for $110. After we reformatted the Touro Mobile Pro to HFS+ Journaled, we put it through its paces, and found the Touro was quite swift. In our USB 2.0 2GB file write and read tests and AJA system read test, the drive came within 0.5MBps or less of reaching the highest speed achievedby drives we’ve tested. In the AJA system write test, it had the fastest recorded USB 2.0 rates, topping other portable hard drives we’ve tested. We also examined the drive’s USB 3.0 speed by attaching it to HighPoint's RocketU USB 3.0 ( ) card and performing the same tests. The results? In all, the Touro Mobile Pro beat out other USB 3.0 drives we’ve tested, writing a 2GB file at 92.9MBps and posting AJA system write and read scores as high as 107.1MBps and 112.0MBps, respectively. All scores are MBps (higher is better), except for Photoshop, which is in seconds (lower is better). 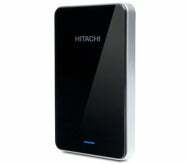 If you need a handy portable drive that matches your mobile iOS device, Hitachi’s Touro Mobile Pro is a great choice. It’s fast and also gives you some extra online storage, something most people would appreciate.